You find the first trail marking outside Connect Hotel. The Southern route (97 km/6 days) a long and wonderfully varied route that steals deep in among rarely visited lakes and bogs in big forests. After the locally popular fishing waters at Lake Nävsjön you’ll reach the dramatic coast, where the hilly terrain will reward you with opportunities for swimming and wild views. You’ll follow the Baltic Sea coast that is completely uninhabited for long stretches. Then the Sörmlandsleden trail turns north again and takes you through a beautiful small-scale agricultural landscape. The walk is edged with old mines, dams and other vestiges of the iron trade. Takes you to the small town of Trosa and then on to the underground in Stockholm (+136 km/8 days). The walk takes you on old roads, past castles and manors, as well as through forests and lakes. One of Europe’s largest steel works is nearby, but never within view. During the walk, the trail forks, offering a variety of longer or shorter alternatives, so keep an eye on the map. 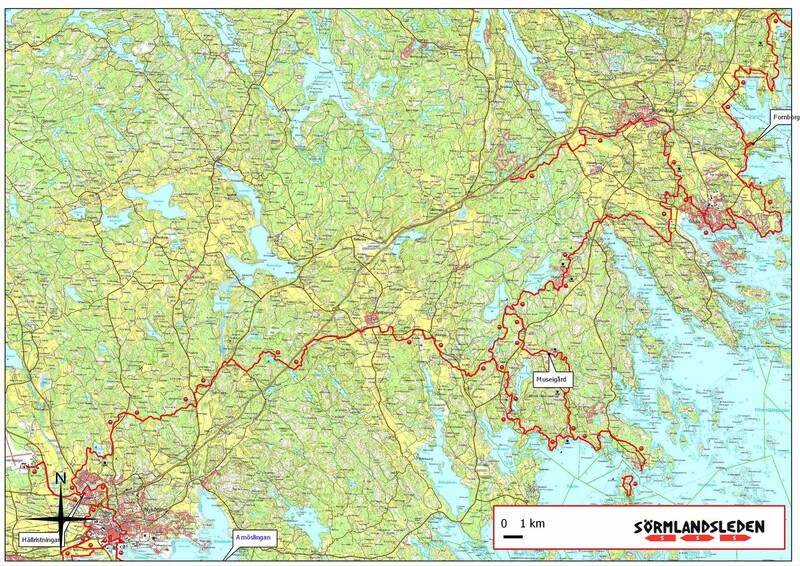 The Sörmlandsleden, or Sörmland Trail, is 1,000 kilometres long, and several sections go through the Nyköping area. Follow the orange paint on trees or posts. At road crossings, the trail is marked with S arrows. Visit the Sörmland Trail website and become a member, which gives you access to maps and useful information about trails, drinking water and overnight facilities. A detailed map can also be purchased from the Tourist Centre. Visit www.sormlandsleden.se for more information, maps and waterposts.